Well, it happened. He's a top draft pick of the Los Angeles Rams. Which mean an all-important thing. We've got to get him suited up to play in the NFL! That's right, your kid is the next big thing to hit the league. So he's going to need the look to match. Well, let's get him outfitted in authentic Rams style. 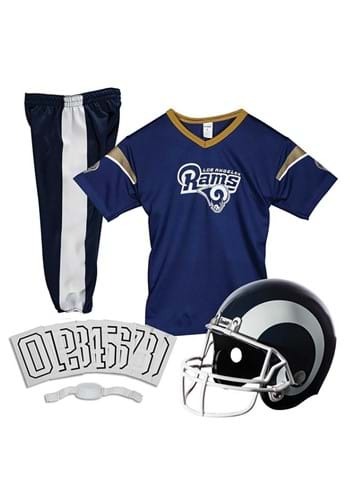 With this NFL Los Angeles Rams Uniform Costume! Okay, okay, we get it. He's a little young to start out in the league for real. But there's no reason he can't feel like he's a superstar when he's all done up in this adorable football set! Modeled after what the pros wear on the field, it has all the gear for him to get a taste of the NFL action. And give it just a few years. You never know, he might just grow up to play for the Rams someday! This LA Ram Uniform Costume is NFL officially licensed from Franklin Sports. Made with 100% polyester doubleknit & jersey mesh fabrics, it has a Rams logo printed on the front. And it comes with iron-on jersey numbers to customize it with your child's favorite player number! The pants fit with elastic waist and cuffs, and the plastic helmet secures with a chin strap. As much as this costume looks like the real thing, we do want to make sure you know that it's a costume helmet only, and it's not designed to offer any protection for backyard ball. Whether for Halloween or to get him his first football fan experience, we're all about it. We're fans, too, after all! Start him out right with this Rams costume, and he'll be ready for the fun. We carry costumes from all the best teams in the league, too, so he can even face off against his siblings or friends for a great group theme!